386 Marlborough is located on the south side of Marlborough, between Hereford and Massachusetts Avenue, with 384 Marlborough to the east and 388 Marlborough to the west. 386 Marlborough was designed by Allen and Kenway, architects, and built in 1882-1883 by Vinal & Dodge, masons, and McNeil Brothers, carpenters, as the home of attorney Charles Eustis Hubbard and his wife, Caroline Dennie (Tracy) Hubbard. Charles Hubbard is shown as the owner on the original building permit application, dated December 5, 1882. Caroline Hubbard purchased the land for 386 Marlborough on December 2, 1882, from Benjamin Williams Crowninshield and Walter Channing Cabot. It was part of a parcel with a 498 foot frontage on Marlborough, extending west to Massachusetts Avenue, that they had acquired on January 20, 1880, from John Brooks Fenno and William Storer Eaton. J. Brooks Fenno and William Eaton had purchased the land that same day from Grenville T. W. Braman, Henry D. Hyde, and Henry M. Whitney, trustees of a real estate investment trust that had purchased several parcels of land on March 1, 1872, from the Boston Water Power Company. 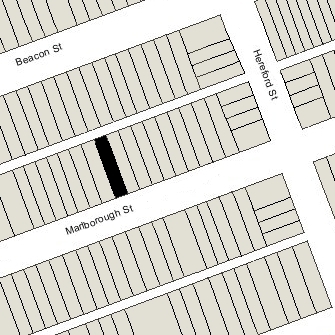 Click here for an index to the deeds for 386 Marlborough, and click here for further information on the land on the south side of Marlborough between Hereford and Massachusetts Avenue. By the 1883-1884 winter season, Charles and Caroline Hubbard had made 386 Marlborough their home. They previously had lived at 339 Marlborough. Charles Hubbard’s brother, James Mascarene Hubbard, lived at 382 Marlborough. 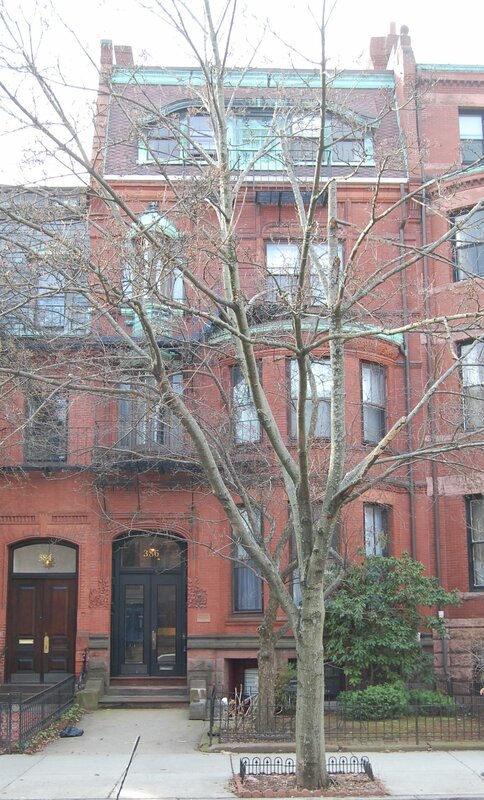 Charles and Caroline Hubbard continued to live at 386 Marlborough during the 1885-1886 season, but moved thereafter. By the 1886-1887 winter season, 386 Marlborough was the home of dry goods merchant Robert Ferguson and his wife, Mary A. (Watson) Ferguson. They had lived at 115 Marlborough during the previous season. They continued to live at 386 Marlborough during the next season, but had moved thereafter to 330 Commonwealth. On October 15, 1888, 386 Marlborough was purchased from Caroline Hubbard by leather merchant William Quirin. He and his wife, Isabella Finlay (Mercer) Quirin, made it their home. 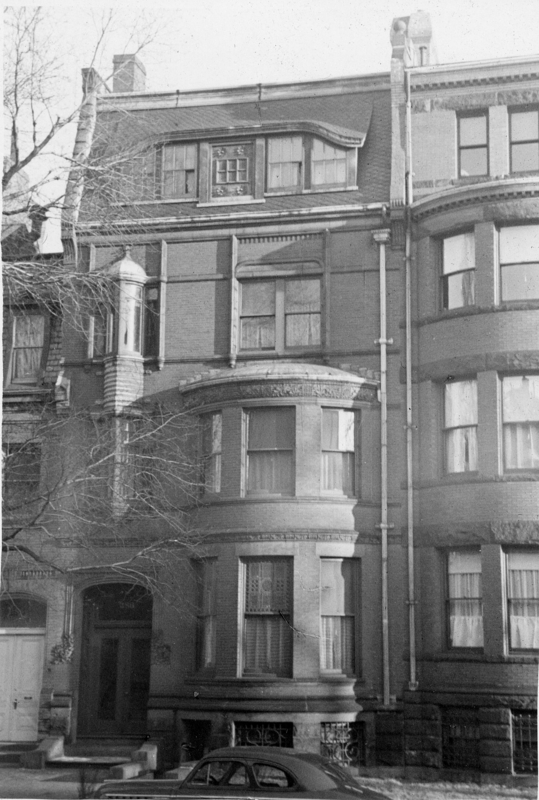 They had lived at the Hotel Brunswick (southeast corner of Clarendon and Boylston) during the previous season and also had maintained a home in Chestnut Hill. During the 1890-1891 winter season, the Quirins were living elsewhere and 386 Marlborough was the home of Louis Higginson, a merchant, and his wife, Anna Louise (Eastman) Lockwood Higginson. May Davidson Lockwood, Anna Higginson’s daughter by her first marriage, to Hamilton Davidson Lockwood, lived with them. By the next season, they had moved to 388 Marlborough and the Quirins were again living at 386 Marlborough. During the 1898-1899 winter season, the Quirings were again living elsewhere and 386 Marlborough was the home of Mr. and Mrs. Charles H. Palmer, probably Charles Henry Palmer, Jr., and his wife, Mary Elizabeth (Spalding) Palmer. He was an investor and developer of railroads and mines in Michigan, Colorado, Montana, and Mexico. By 1900, they were living at the Hotel Somerset. William Quirin died in November of 1901. In his will, he left 386 Marlborough in trust for the benefit of his wife and their two daughters, Berthe Louise (Quirin) Buchanan, the wife of Arthur William P. Buchanan, and Pauline (Quirin) Cockayne-Frith, the widow Reginald Cockayne-Frith. Isabella Quirin continued to live at 386 Marlborough. By the 1913-1914 winter season, she had been joined by Roger Alonzo Rhodes, a student. He continued to live there during the 1915-1916 season, but had moved to New York City by 1917 when he enlisted in the US Army. Isabella Quirin continued to live at 386 Marlborough during the 1921-1922 winter season, but moved thereafter. By the 1922-1923 winter season, 386 Marlborough was the home of Mary Ann (Sheffield) Moriarty, the widow of wholesale dry goods merchant George Andrews Moriarty. She previously had lived at 26 Fenway. Their unmarried son, G. Andrews Moriarty, Jr., a lawyer who would become a noted genealogist, lived with her. He previously had lived at The Marlborough at 416 Marlborough. They also maintained a home, Ridgemere, in Newport. They continued to live at 386 Marlborough during the 1923-1924 season, but moved thereafter to Newport. Isabella Quirin died in January of 1924 in Wellesley. On March 31, 1925, the trustees under William Quirin’s will transferred 386 Marlborough to Berthe (Quirin) Buchanan and Pauline (Quirin) Cockayne-Frith Peto (who had remarried in July of 1903 to Geoffrey Kelsall Peto). Arthur and berthe Buchanan were living in Montreal, and Geoffrey and Pauline Peto were living in Kilmeston, England. 386 Marlborough was not listed in the 1925-1927 Blue Books. On October 12, 1926, 386 Marlborough was purchased from Berthe Buchanan and Pauline Peto by real estate dealer John S. Cronin . He had acquired 384 Marlborough in February of 1925. By the 1927-1928 winter season, 386 Marlborough was the home of John Knight and his wife, Florence E. (Doane) Knight, who operated it as a lodging house. They previously had lived at 317 Marlborough. John Knight was a teacher at Charlestown High School. On January 24, 1930, 386 Marlborough was acquired from John Cronin by Mary A. Walsh. The Knights continued to live there and operate it as a lodging house. Florence Knight died in 1933. John Knight continued to live at 386 Marlborough until about 1935, but had moved to Dorchester by 1936. On December 31, 1935, Albina M. Mitchell foreclosed on a mortgage she held on 386 Marlborough and took possession of the property. On April 29, 1936, it was acquired from her by real estate dealer Ray C. Johnson. 386 Marlborough was not listed in the 1935-1937 Blue Books and was shown as vacant in the 1936 City Directory. On October 19, 1936, 386 Marlborough was acquired from Ray C. Johnson by Miss Katherine MacAuley, a nurse. She previously had lived at 102 Appleton. Her brother, Murdo MacAuley, lived with her. He died in March of 1938. She operated 386 Marlborough as a lodging house until her death in August of 1965. In her will, she left 386 Marlborough to the Park Street Church. Two of the Church’s parishioners, Robin Marvin and Willard Dickerson, organized the International Fellowship House to provide short-term housing for international students, which began operations in mid-1966. International Fellowship House first leased 386 Marlborough from the Church, and then purchased it on May 22, 1973. In March of 1986, International Fellowship House filed for (and subsequently received) permission to legalize the occupancy as a lodging house. 386 Marlborough remained the International Fellowship House in 2017.